On the night of June 13th 1944, Lancaster KB731 was on an operation to Cambrai in support of the Canadian Army, before the aircraft had reached the target area it was hit badly by flak, the damaging aircraft came down near the village of Vieux-Berquin. Of the crew of seven airmen, two managed to escape the area and became evaders from captivity. F/O Edward Ronald Lowe of Vancouver B.C. In November of 2012 this site was contacted by the Program Manager of the Juno Beach Centre in France, she had a request from the members of this northern French village, Vieux Berquin. The village had been in touch with one of the crew men's family for a number of years. This family had presented the villagers with the materials to create an association flag which was used during the commemorative ceremonies. The village's association wanted the Juno Beach Center to help find a family contact from one of the five airmen buried there to rekindle the the tie between Canada and their village. The Juno Beach Centre in turn contacted us and the search began. With ads placed in the Legion magazine and in the Regina, Calgary, Edmonton and Montreal newspapers bringing no results we thought of a fellow researcher who had helped out in the past when he provided a wealth of information of Mooseman Al Turner. When we contacted Oren Robison it did seem like a long shot. But once again he came through for us. He put us in touch with Doug Chisholm who had interviewed the widow of William Lacey. When I contacted Doug he had a ten year old phone number and a name, Millie Francoeur living in Moose Jaw. So we immediately called the number and was surprised by finding Mrs. Francoeur at home and willing to talk to us about her late husband. It was a pleasant conversation that covered her second marriage and the loss of her son Veron Lacey and how pleasantly surprised she was that anyone still cared about F/O Lacey and his crew. I told her I was going to find a way to have a flag sent in her honor to Vieux-Berquin. And so started another search, how to put it all together a presentation of vintage RCAF flag for Mrs. Francoeur in Saskatchewan and a flag for Vieux-Berquin in France. I located the email address of Dean Black, Publishing Editor for Airforce Magazine and Secretary RCAF Association Trust Fund. I explained the situation and the reason for the flag ceremony. Literally within minutes he returned the email and started into action the events of the flag presentation which occurred June 13th of this year (2013) He was also able to supply the vintage RCAF style flags. 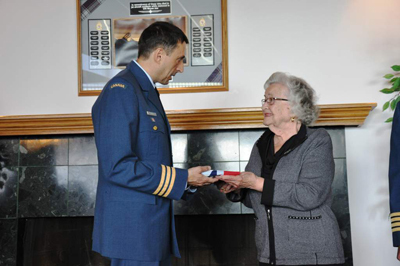 The planning of the event was by Captain Susan Magill of 15 Wing in Moose Jaw, who arranged to have Lieutenant-Colonel Mike Mirza, Commanding Officer of 419 squadron and Colonel Paul Goddard Commander of 15 Wing doing the flag presentations to Mrs.Francoeur. Capt. Magill then prepared the second presentation flag for delivery to Vieux-Berquin. So our deep appreciation to all those who helped bridge the past with the present.